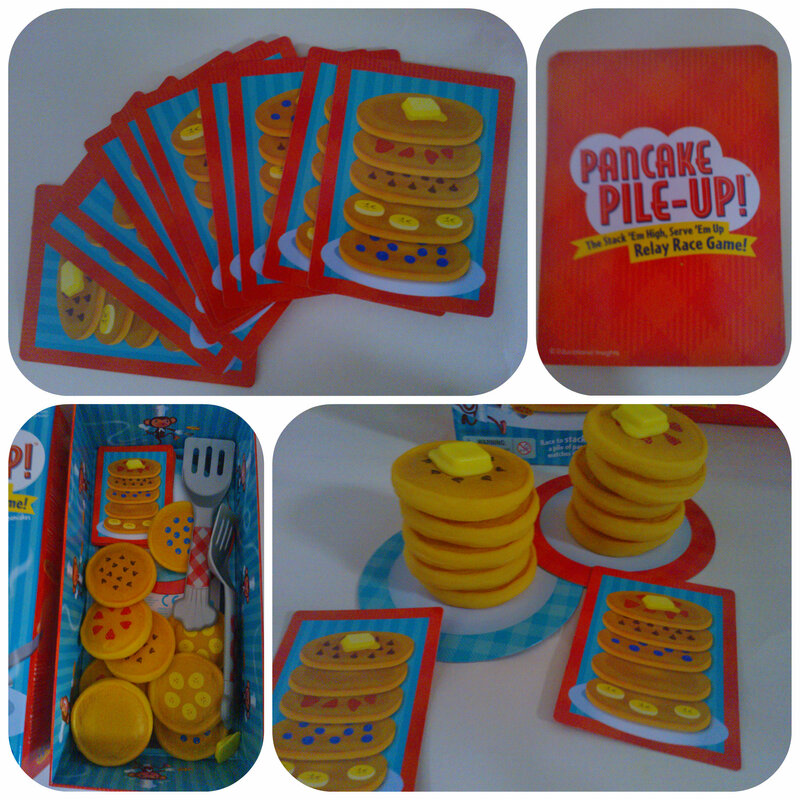 Pancake Pile-Up from Learning Resources is a fun, fast paced team game that all the family can enjoy. With two teams of up to six players in each, this is a game that encourages team work, promotes physical activity and builds a competitive atmosphere that everyone get’s involved in. 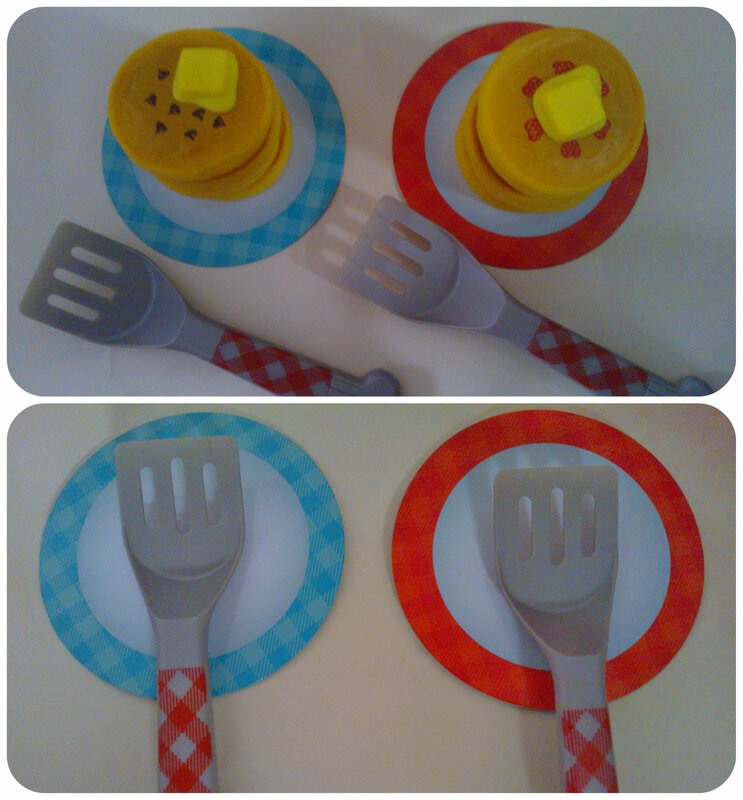 Also for younger players it helps develop recognition with the different toppings on the pancakes and also hand eye coordination as they balance the pancakes on the spatulas. 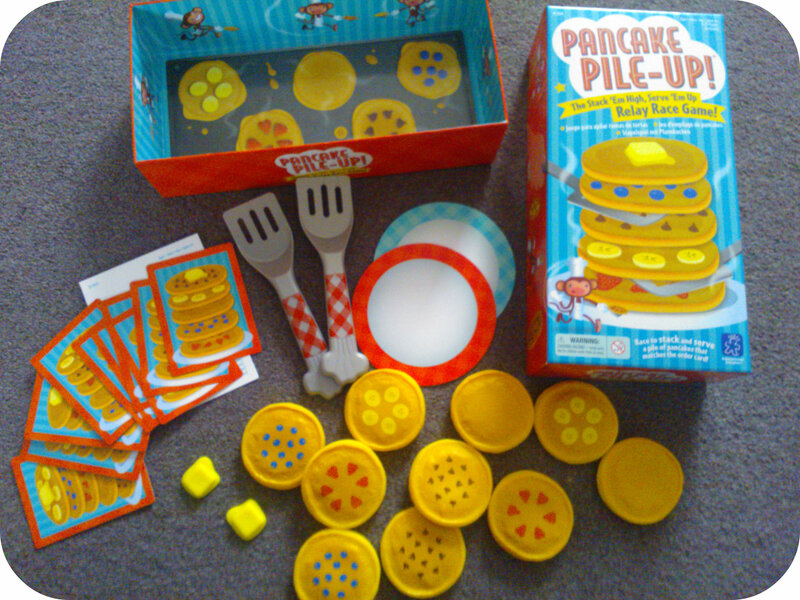 The game comes with two plastic spatulas, 10 soft plastic pancakes (in 5 different flavours), two plastic pieces of butter, 10 order cards, two cardboard plates and instructions. Being soft plastic, the pancakes are durable and won’t break which is what you need when you are carrying them across the room. The box is made of an extremely sturdy cardboard which is fantastic to store the game in, but the bottom is actually used as part of the game play. It has the image of a griddle on it, upon which you place the pancakes and this is where you collect them from during the game. First you need to separate players into two teams and then select an order card which shows you the order of the different flavoured pancakes that you need to stack. Also place the plates at one end of the room and the griddle with the pancakes at the other. Then it is time to start, with the first player in each team running across to the griddle with their spatula, selecting the correctly topped pancake and running back to their team, carefully balancing the pancake on the spatula and placing it on the plate. The next player in the team then runs across and collects the next pancake on the list until a tower of pancakes is built that matches the order card. The first team to successfully do this are the winners! When I showed my two children the Pancake Pile-Up game, their eyes lit up and they were eager to play. They both love playing games and often prefer them to toys so I knew they’d be excited at a new game. They immediately took charge and decided to be team captains and picked their team members from a choice of mummy, daddy and their grandparents. Then the relay started and they were away, I have to say the atmosphere in the room was brimming with cheers, encouragement and excitement as we took our turns at collecting a pancake for the pile. Once the pile was complete and we had a winning team they immediately wanted to mix the teams up a bit and play again. The suggested age range for this game is 4-8 years, so this was perfect for 6yr old Miss M. Mister B is only 3yr’s old but is more than capable of playing this and totally grasped the game although did require a little direction. He often got caught up in the excitement and came back with a different flavoured pancake to which he went for but non the less we let him off as he was enjoying it so much! Pancake Pile-Up is such a simple game but one that children absolutely love and it really does bring people together. Normally we are sat down to play games and children can get bored or distracted, but with Pancake Pile-Up we were all (adults included) totally engrossed in the game throughout as we cheered, motivated and encouraged each other along in a bid to be the winning team. We love Pancake Pile-Up, it has been a huge success with our family. I think the relay team aspects and the physical side of it really add to the fun and enjoyment. My children have played with it again and again sometimes just by themselves racing to build their pile of pancakes. 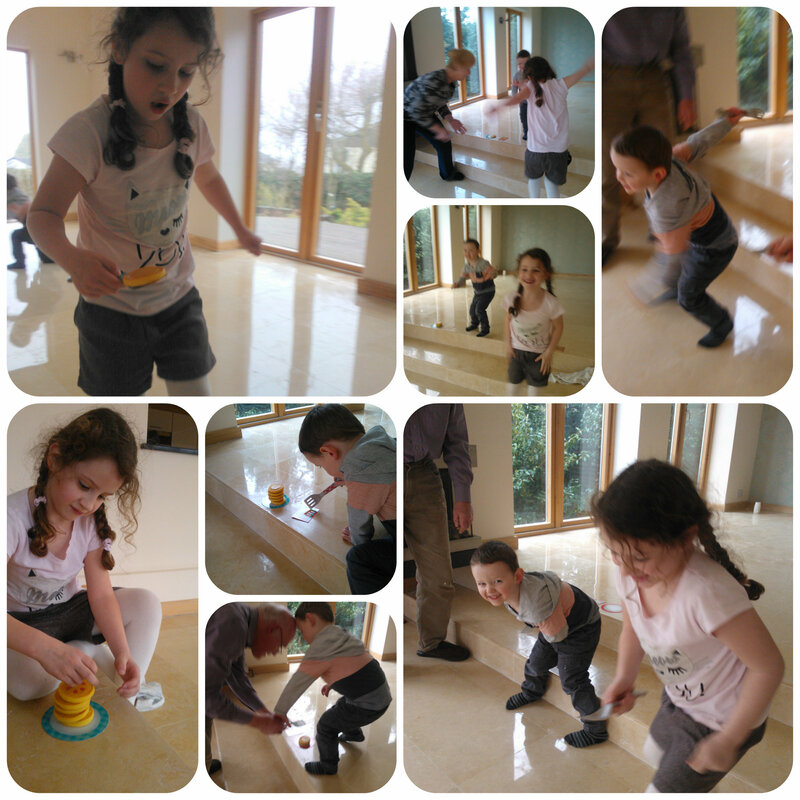 We are seeing family this weekend and my children are keen to take it with us to play with Auntie K, Uncle K and Cousin L. I think this game is versatile and would make a great children’s party game, and definitely one to bring out at Christmas. But with pancake day on it’s way this year, it’s perfect to get children thinking about Shrove Tuesday and planning their desired toppings for their pancakes. 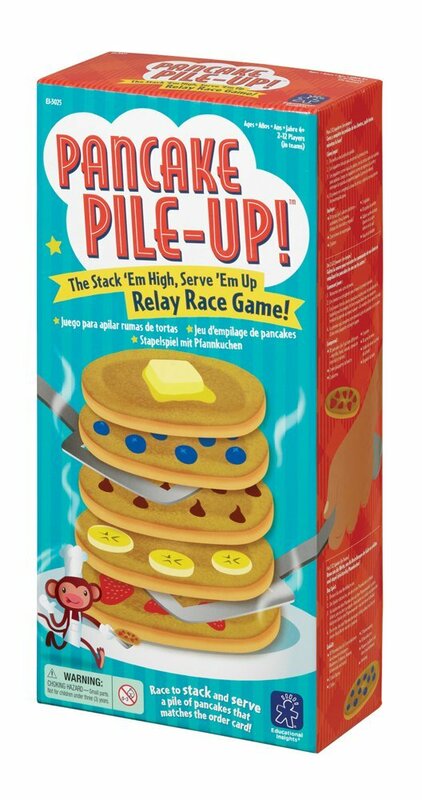 If you have young children and are looking for a fun, quick paced family game that everyone will enjoy, then why not give Pancake Pile-Up a try? All reviews are my own and my family’s opinions and we received the game in order to write the review. This entry was posted in Reviews and tagged game, kids, Learning Resources, pancake, relay, teams by Fiona Martin. Bookmark the permalink. Jenny @ The Brick Castle recently posted…Who are better talkers – men or women? The Andrex Washlets Challenge. lol My parents have cleared out for decorating – I knew it’d be a good space to run up and down in! This looks like such good fun! That looks fantastic. 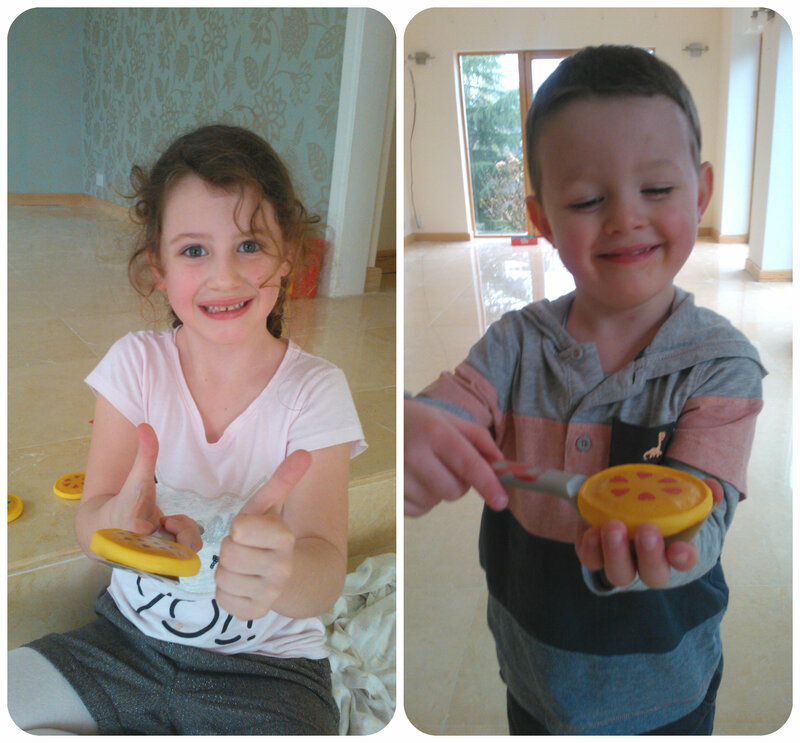 Learning Resources have a great range of really innovative products, this looks like a great addition to it and your two look like they are having so much fun! It looks like you have had so much fun with this game! It definitely looks like something that we would enjoy together as a family and is very different from anything else we have.